After a good result at Alnwick Ford Equestrian on Wednesday, I changed my prelim entries at Todburn today to two Novices, setting myself the aim of achieving 62%+ to gain two test results towards PetPlan qualification. Enjoy a read through our latest competition report blog post to see how we got on! After riding, I wanted to get Louie's socks and tail washed so it was one less thing to worry about in the morning. PLUS it means an extra bit of time in bed on a Sunday morning! (The alarm was still set for 6.45am!) Andrew came down to the yard after a day out golfing to help speed things up and we have a good system of double teaming Louie's socks so it doesn't take too long to do at all. You could definitely tell the difference when washing his tail having only washed it on Tuesday evening, as the stains & mud came out much easier. And boy, did we need all the help we could get to speed us up... Every exposed part of Louie was in some way was GREEN! Tail (that was plaited)? Yes. I took a breath, and thought I'll deal with it later so I could plait. Straight after plaiting, I re-washed Louie's tail. Annoyingly, he'd managed to get green poop marks right at the top, so it was the easiest or quickest task. Next, it was onto his face, which to be fair, with some tough brushing lifted, as did the top of his front legs. However, the tops of his back legs & hocks where he'd decided to spend the whole morning pooping, a habit which I had started to think he had grown out of.... Maybe not just yet! A little later than planned, we set off and arrived pretty much right on time as to when I had hoped we would. As I'd moved up classes after I'd paid my entry, I owed the organiser a few extra £'s so I headed straight over to give her it. We got chatting, as you do, and one of the stewards asked if we'd enjoyed the PetPlan finals. We were talking about the step up to Novice, and I commented on the shock I'd got when reading through the test sheet as the other Novice I'd done with Louie seemed much simpler despite being a higher numbered test. I happen to say how hard I thought Novice 24 was & that when I tried out some of the new moves the evening before... Both of them just looked at me. "You do know it is Novice 28?!" So I spent the next five minutes frantically learning Novice 28... I can't imagine what would have happened if this realisation had occurred when I stood outside the arena, watching the person before me finish their test. Well, I can. It would have been panic!! This test was actually a bit less frantic than the one I had learnt and was actually one we've done before. Louie didn't feel quite as forward in the warm up and was responsive & obedient. I gave him a good warm up, putting in some of the moves we'd practiced the day before, as well as our usual warm up routine. It was soon our turn to go, and I headed over to the arena. In we went, where Louie felt a bit spooky and behind the leg, but luckily the judge was still writing, so we have 2-3 laps around the arena before starting our test. BEEP. In we went, down the centre, turn right, do a 3-loop serpentine. WRONG. Of course, it was wrong... firstly there was no starting point of the serpentine because I was still on the the centre line, and as soon as I heard that beep to correct us, I thought, WHY did I do that!? We carried on with some creative circle to bring us back to C. After that, I was really pleased with our test; Louie really tried his best and despite a couple of inconsistent moments, I was pleased with how he went. Back at the wagon, I was disappointed with my mistake, but I really tried to put it behind me and make sure I REALLY knew our second test. We had about 40 minutes in between, so Louie enjoyed a munch on his hay net, while I ran through my next test about 100 times. I usually allow about 15 minutes for our second test, unless we have had a long time in between tests. I aim to get Louie sharp and off the leg, as well as supple and soft. He came back out a bit sticky but make the best use of the long sides to the warm up, I pushed him on and he soon felt much more into my hand. I headed up to the arena when the horse before us was half way through their test, and this time Louie went in much more confidently. We were beeped in... 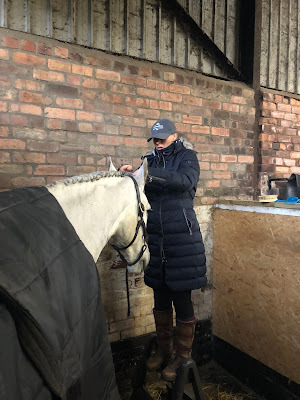 I was concentrating so hard on where I had to go and what I had to do, some of my riding definitely suffered, but with pressure of going wrong again, I knew that this was in risk of happening. You can really tell in some of the movements that Louie's new to this level and need to develop and come into it more, but overall I was very pleased with how he had gone. I took him back to the horsebox where he enjoyed a wash down and a massage while eating his haynet. We'd parked next to a couple of old friends we used to be on a livery yard with so we nattering away with them before heading to the venue's small cafe for a hot drink and something to eat. It was really great to see them, and see them enjoying being out and about with their new pony. I also got to catch up with Stevie Purves Photography again, who was supporting one of his sponsored riders and friends, Vicky. I first met Vicky about seven years ago, when there was an accident at a British Dressage competition I was at with Buddy. It was quite serious and the air ambulance had to come, so competitors were told to leave the area. We were chatting and ended up going on a hack down a country lane nearby. Since then we've kept in touch, but I don't think we've seen each other for 4-5 years now! It was lovely to see her horse, Flynn, who is now 19 and who have been together since he was a three year old, looking FANTASTIC and enjoying being out at a pony party! While chatting, I headed into the scorer's hut to pick up my test sheets. I was thrilled to see a lovely red ribbon and another blue one on top of my sheets. I was even more pleased with Louie to see that he has blasted my ambitions of 62% coming out with a 68.54% in Novice 28 & 67.12% in Novice 30. Well, we'd got November fully booked with dressage competitions to secure our Prelim Winter Regional qualification. We're re-focused to gain PetPlan qualification, so just need one more test sheet of 62% or higher before June (ish) time next year.